In US mobile market, more than half of BlackBerry users intend to switch to the iconic iPhone as Wall Street experts pull the plug on RIM’s recovery plans. 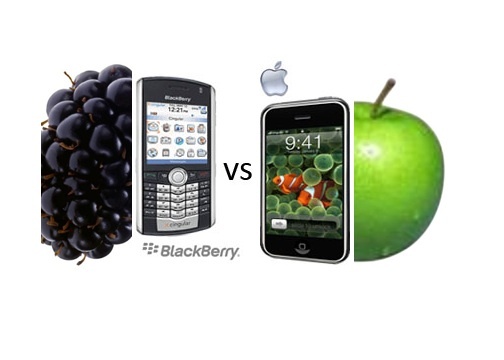 While I was reading some researched which compared iPhone and Blackberry user habits, I came up a question in my mind. I wonder my blog reader choose which mobile device when they tweet ? An example from my country ( Turkey) % 59 of twitter users prefer mobile devices to tweet. When it comes to device selection, Turkish users prefer BB with a percentage of % 45 , on the other hand only % 27 iphone users prefer to tweet via their devices. Ok, I agree to type with qwerty keyboard, but is it enough for RIM company to survive in smartphone competition. I am looking forward your comments. Which smartphone do you prefer to tweet ? BB or iPhone ? Tags: Blackberry, choose, device, iPhone, RIM, smarphone usage, social media, Twitter. The study surveyed more than 30,000 U.S. mobile subscribers and found Samsung to be the top handset manufacturer overall with 25.3 percent market share. Google Android strengthened its lead in the smartphone market to reach 47.3 percent market share. For the three-month average period ending in December, 234 million Americans age 13 and older used mobile devices. Device manufacturer Samsung ranked as the top OEM with 25.3 percent of U.S. mobile subscribers, followed by LG with 20 percent share and Motorola with 13.3 percent share. Apple continued to gain ground in the OEM market with 12.4 percent share of total mobile subscribers (up 2.2 percentage points), while RIM rounded out the top five with 6.7 percent share. In December, 74.3 percent of U.S. mobile subscribers used text messaging on their mobile device, up 3.2 percentage points. Downloaded applications were used by 47.6 percent of subscribers (up 5.1 percentage points), while browsers were used by 47.5 percent (up 4.6 percentage points). Accessing of social networking sites or blogs increased 3.8 percentage points to 35.3 percent of mobile subscribers. Game-playing was done by 31.4 percent of the mobile audience (up 2.6 percentage points), while 23.8 percent listened to music on their phones (up 2.9 percentage points). 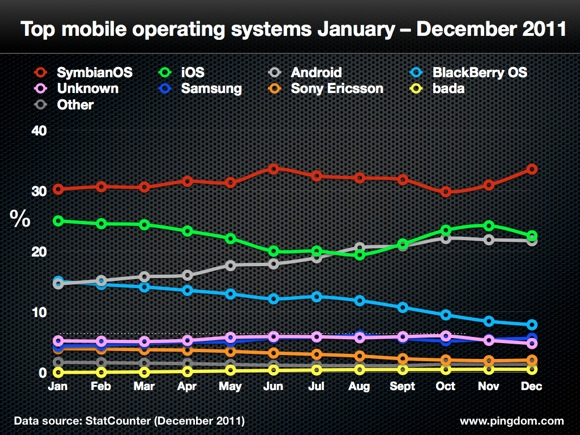 Tags: Apple, LG, Motorola, RIM, Samsung, US Mobile Market. Remember when RIM said its strategy is to focus on marketing its decaying line of BlackBerry devices for most of 2012 while we sit and wait for those shiny new phones it keeps promising us? Four noseless super heroes based on some junk BlackBerry owners tweeted about a month ago.Each hero stands for some vague “bold” concept, but we honestly don’t have the energy or patience to type it all out here. It’s like they’re not even trying anymore. Research In Motion is reportedly exploring the possibility of licensing its forth coming BlackBerry 10 platform to competitors such as HTC and Samsung, Jefferies & Co. analyst Peter Misek has said. “We think some of this has already been started with RIM likely agreeing to license Blackberry 10 to Samsung, HTC, and possibly others,” Misek told InformationWeek. However, the company makes the bulk of its revenues from selling hardware, not licensing software, and the company would need its software to be provided in a vast array of competing handsets to recover the loss of income that migrating to a software firm would entail. Tags: Blackberry, HTC, RIM, Samsung. Tags: Android, Apple, Blackberry, iOS, RIM, Symbian.